Jilda and I went to Sedona, Arizona several years ago for our anniversary. We'd heard about Sedona through friends who promised us we'd love the area. They were right. We stayed at a small place on the edge of town in cottages that were rustic and felt good. I could smell the pine in the rough hewn logs used to build the cabins. The first night we slept with the windows open so the cool spring breeze would blow across us while we slept. On the nightstand was a journal we thought someone had left. When we looked inside, it was a journal placed there by the owners of the cottages. Guests were encouraged to write something for the reading pleasure for those who followed. Reading back through the entries, we found funny notes, some that were simply the names of guests and the dates of their stay. Others were well-written posts that were poignant and moving. We tried to write something of substance, but who knows if our words hit the mark? One day we headed out through Flagstaff and on to the Grand Canyon. We'd seen it from the tiny porthole window of an aircraft 5-miles in the sky, but it was the first time we'd seen it up close and personal. It took my breath away. I didn't have much to write about tonight so I flipped back through old photographs and came across the picture below...a post was born. Very impressive, the Grand Canyon. Your photo is beautiful. I've been to the Grand Canyon a few times and it is glorious and I'm always humbled to know how lucky we are to live in a country with all this beauty. Took a long time to build that...actually it's still a work in progress. I've traveled around the world, but the Grand Canyon was one of the most breathtaking things I've ever seen!! I'll never forgot my (then) 10 y/o g'daughter's grudging compliment: "I just thought we were going to see a big old hole in the ground." This is a wonderful image. I love that idea of a journal for people to write in about their time spent in this place. It's great. 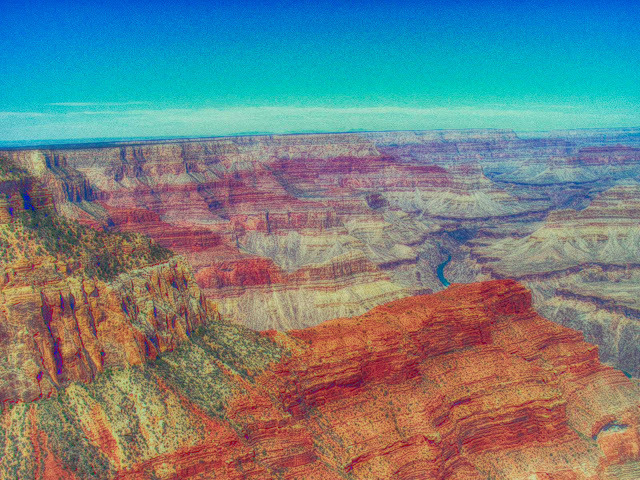 The Grand Canyon never disappoints, no matter how many photographs of it you've seen. The Grand Canyon is breathtaking! Whoever came up with the idea for the journal is a genius. It is a great gift to the people who stay in the room after. I've heard a lot of good things about Sedona, but never been there and I haven't seen the Grand Canyon either. So thanks for sharing that beautiful picture. Nice to have memories like that. You know how to kick in a memory. The room journal reminded me of the trail journals on the AT. One in every lean-to and shelter. BUT most of all I thought of the Canyon. I didn't think I would be that impressed, BUT upon seeing it I COULD NOT BELIEVE THE SIZE OF THAT HOLE!WE camped on the edge in a popup years and years ago what a thrill. YOu have caught the sun at the right angle to bring out the color, good shot. I like the journal Idea! That is too cool. Great shot of the Canyon! Looks like a scene off The Coyote and Roadrunner cartoon.